You can rent a Donkey Bike for longer than just a single ride. 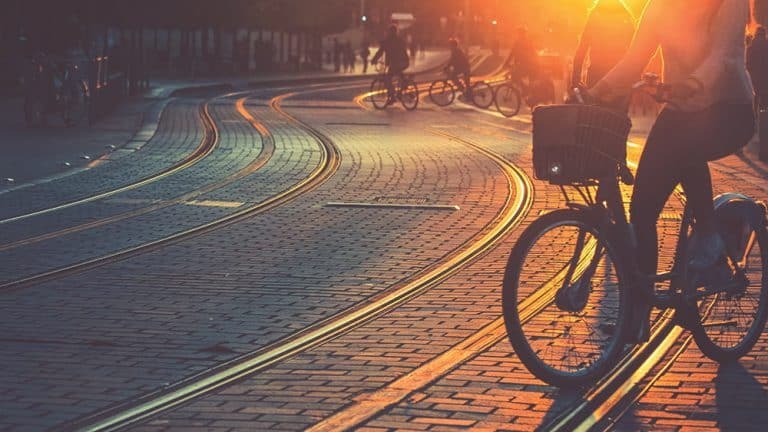 The best possible way to see Munich is by bicycle, and with around 80% of Münchners owning the two-wheeled transport, there’s little wonder that the city recently named itself Germany’s Radlhauptstadt – the bicycle capital. Rent yourself a bike in Munich and join them – to discover that Bavaria is not just good for Oktoberfest. Although that’s pretty awesome too. There are over 1,200 kilometres of cycle track twisting through the city, with more bike-stands than you can shake your pump at. And they’re not stopping there – the city council is looking to increase that figure significantly with millions of euros of investment over the next few years. They even have specialised bicycle routes where other traffic cannot exceed 30 Kph and cyclists can use the full width of the road. It’s a great time to get your rental bike out and explore Munich’s centuries-old architecture. In order to explore the capital of Bavaria by bike, you must first be in possession of one. You can easily find all of our Munich bike rental locations in the city using the app. Please, don’t forget to brush up on German cycle laws, and you’ll find a handy, bite-sized guide below with all the essentials. 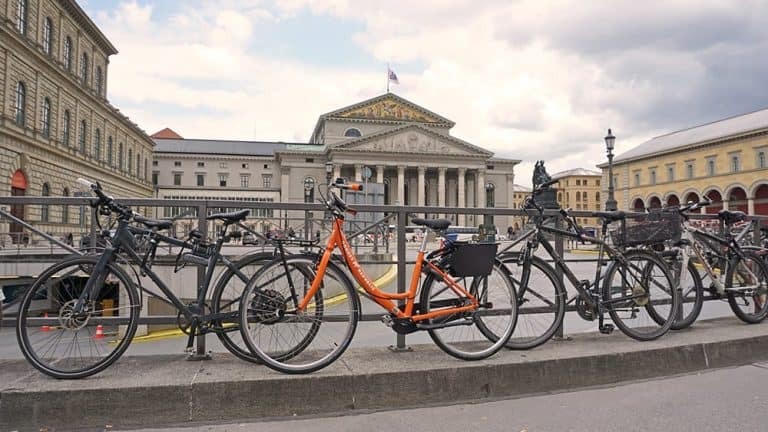 Then all you have to do is decide where to ride – so take your pick from the following top cycle locations in Munich. Alternatively, you could just cycle them all – the ice-cold beer can wait. Munich’s Altstadt (old town – obviously) is the heart of the city, and probably your first port of call with your rental bike. It’s pretty easy to find, as it’s located within the central ring road – which used to be the route of the medieval city walls. Here you’ll find most of the city’s main attractions, including the Marienplatz, the main square since 1158, dominated by the beautiful New Town Hall. The square is always a hive of activity – and you’ll enjoy a wide variety of buskers and street theatre performances on a summer’s day. Discover the famous Frauenkirche, the picture-postcard cathedral and symbol of the city, dating back to 1488. Browse for fresh produce at the difficult-to-pronounce Viktualienmarkt, or simply park up and enjoy the many wonderful beer gardens. Hundreds and hundreds and hundreds of beer gardens. Just remember to ride responsibly. Located a short ride east of the centre, Haidhausen is a phoenix from the ashes. Formerly a neighbourhood of an insalubrious nature, it’s now home to some world class bars and restaurants, with beautiful side streets and cobble alleyways, colourful buildings and hundreds of art galleries. There’s a reason it’s known as “The French Quarter”, as it resembles the back streets of Paris in name and design. Get lost exploring the neighbourhood on your rental bike, but don’t miss the Maximilaneaum, a striking neo-gothic behemoth of a building home to the Bavarian parliament and exemplary students. Haidhausen also boasts the Gasteig Munich , a cultural centre and HQ to the Munich Philharmonic Orchestra. Nearby you’ll also find the Duetsches Museum, an enormous collection of science and technology exhibits that will keep you entertained for hours. 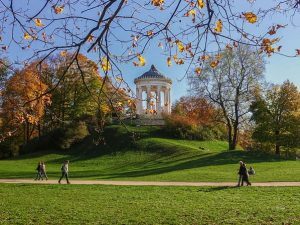 A visit to Schwabing in the north of Munich is a must if you’re on a rental bike – because you can explore the Englischer Garten, one of the world’s largest public green spaces – larger than New York’s Central and London’s Hyde Park. This makes it the perfect spot to cycle round, with an abundance of quality biking trails to get lost down. Outside the park, there’s a wealth of bars and clubs in this bohemian quarter that are hugely popular with a younger crowd, and the area promises some of Munich’s best shopping – famous for its boutique stores and unique retail outlets. Bordering Schwabing you’ll also locate Munich’s Olympiapark. 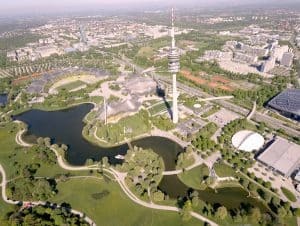 The Olympic Park is a wonderful experience for Munich residents who use it for leisure and for tourists from all over the world who go there for sightseeing. Whether you go for inline skating, basketball, skateboarding, jogging, football, cycling or minigolf, a jumble sale or a live concert in the Theatron, the park is all about coming together. You can come across top stars at any time of the day, at least those that have been immortalised in the Munich Olympic Walk of Stars at the Olympic Lake. And when the sun competes with the unique silhouette of the Olympic tent, you can grab a Bavarian snack in the beer garden, on the grass, by the Olympic lake or you can also climb up to the roof of the Olympic Stadium; The guided tour up there is one of the most spectacular tours in Munich. You can also look at the city from 190 metres high, if you get up to the Olympic Tower. If the weather allows, you can see as far as to the Alps from the Salzkammergut to the Allgäu Alps. 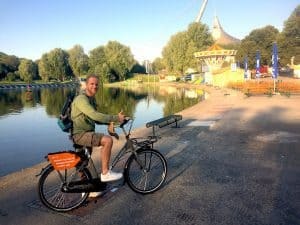 The Olympic Park in Munich, site of the 1972 Olympics, is now home to a diverse range of concerts and sporting events, as well as a great place to cycle the green space in its own right. BMW-Welt, the car manufacturer’s factory tour and museum is also located here, for those of you that enjoy four wheels as well as two. 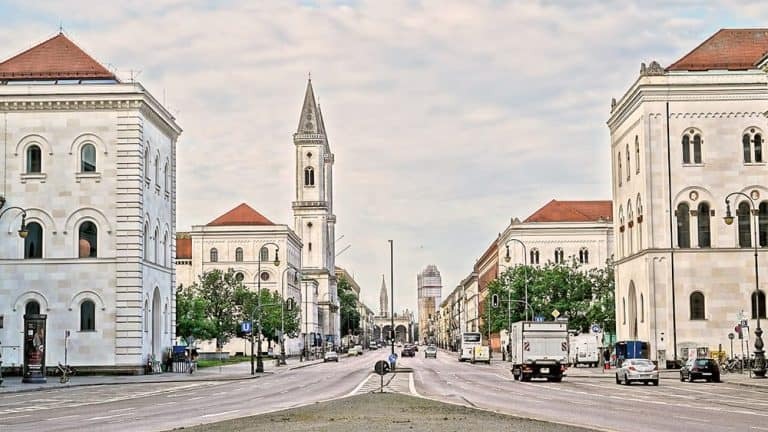 Known as “the brain of Munich”, Maxvorstadt is home to a high number of educational establishments, which in turn attracts hundreds of students – so the area is extremely lively during the day. 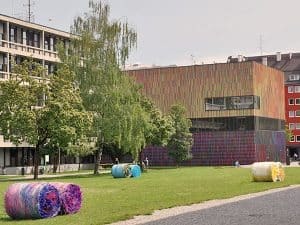 You’ll also find a multitude of amazing museums and art galleries, including the Pinakothek der Moderne, which, as you might expect, is dedicated to modern and contemporary pieces and is one of the largest collections of modern art in the world. 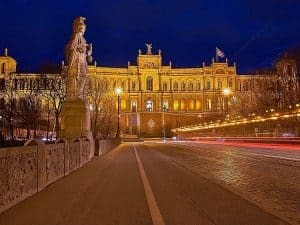 There’s the Lenbachhaus, a beautiful Florentine villa and art gallery, and the State Museum of Egyptian Art to name just three of around 80 institutions. Shoppers can enjoy even more boutique stores here, such as fashion hot spot Kauf Dich Glücklich, and you can unwind at the Max Emanuel Brewery beer garden afterwards for some traditional Bavarian hospitality. Home to Munich’s vibrant lesbian and gay scene, Glockenbach is an extremely diverse region of the city and its shows. There’s something for everyone here, with trendy bars and restaurants at every turn, great shopping and beautiful architecture. Put your rental bike kickstand down at the Gaertnerplatz – the area’s central hub where you can meet thousands of multicultural and liberal locals enjoying life, love and happiness. 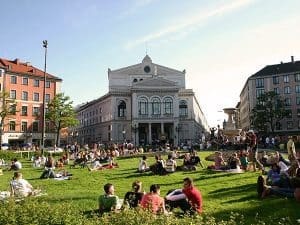 You can take in a performance at the Gaertnerplatztheater that overlooks the lively central green, or just kick back with a beer and watch the world go by; this area is the very definition of people-watching. Although 20 minutes northwest of the city centre, Nymphenburg is well worth visiting with your rental bike, as it’s here you can explore the beautiful Nymphenburg Palace, which is one of Munich’s most popular attractions. 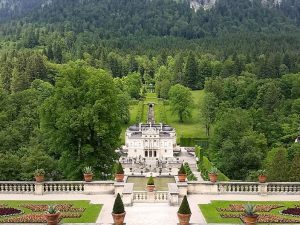 The former seat of Bavarian rulers and kings, the palace dates back to 1664, and is a stunning construction with extensive, well maintained gardens stretching to over 200 hectares. 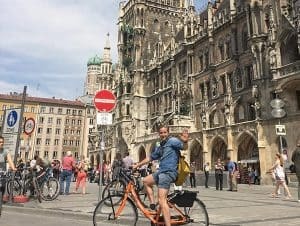 It’ll take you about half an hour to get here from Marienplatz – but you’ll rarely stray off a bike path en route – so the journey is just as good as the destination. Don’t miss the botanic gardens next to the palace if you’ve not had enough of peaceful green spaces yet. Using hand signals are a requirement in Germany, stick your left arm straight out for turning left, and your right arm straight out for turning right. Sehr einfach! At the moment wearing a bike helmet is not compulsory for adults in Germany – but we heartily suggest you do. Those things save lives. Children under 11 years of age are required to wear one – so make sure their little heads are covered with a cool helmet. Munich has an extensive network of bike racks to secure your two-wheeled friend safely. You’re allowed to take your rental bike on the U-bahn and most regional rail networks –but be aware you’ll need to buy it a ticket. It’s like a family member anyway, isn’t it? You’re not allowed a bike on buses or trams, and no transport will welcome you aboard during rush hours. Beers on bikes? Tempting – considering Munich’s history with beer drinking – but cycling under the influence will slap you a hefty fine – not to mention you could do yourself or someone else a serious injury. And don’t use your mobile or earphones while riding – that’ll cost you ten euros.